Advantages: Interesting subjects; excellent printing and registration; high quality instructions; includes bonus markings; useful replacement for inferior decals in a number of kits. Freightdog Models' latest decal release is a comprehensive set of RAF Pale Blue and Pale Pink insignia and Pale Blue serials to suit 1/72 scale Anti-Flash White schemes for a range of Cold War British aircraft. This new release comprises two full-sized decal sheets. The first sheet includes national markings, plus some bonus markings and serials. The second sheet is completely covered with Pale Blue serials. Roundel sizes range from 36" to 56", while serials run from a tiny 4" to 48". 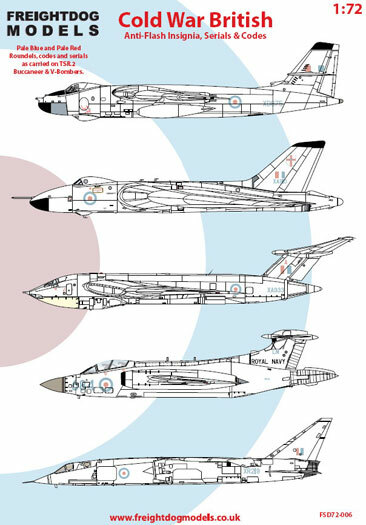 These markings will be suitable for any British aircraft in Anti-Flash White, but Freightdog's instructions provide specific marking information andn diagrams for the TSR.2, the Vickers Valiant B.1, Avro Vulcan B.1A, Handley Page Victor B.1, Blackburn Buccaneer NA.39 and Buccaneer S.2. Several bonus markings are supplied to permit specific aircraft to be modelled. These include Waddington Wing / City of Lincoln badge for the Vulcan, a pink "A" Code letter for a Victor and 24" 700Z NAS codes for Buccaneers. Pink ejection warning stencils are also supplied on this sheet. As usual for Freightdog, the decals themselves are beautifully printed, in perfect register and with no sign of dot-screen on the pale colours. These will be especially useful for modellers with the Airfix TSR.2, as these decals are noticeably superior to those supplied with the kit. If you are contemplating any Anti-Flash White RAF or RN projects, this new release from Freightdog will be of great value.